Using ready-made soup as a base for this hearty stew means there's no rummaging in cupboards for the right ingredients and no chopping either. We've used a fresh soup, but you could try a can or jar instead. Season the lamb and mix with the ground coriander and cumin. Using your hands, shape into 20 meatballs. 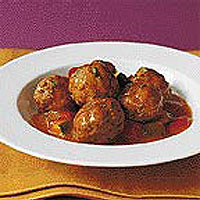 Heat the oil in a frying pan, add the meatballs and fry on all sides for 5 minutes, or until browned. Transfer the meatballs to a saucepan and pour in the soup. Bring to the boil, then simmer, uncovered, for 10 minutes, or until the lamb is thoroughly cooked, the juices run clear and there is no pink meat. Season, then stir in 2 tbsp of the fresh coriander and serve with rice or couscous, sprinkled with the remaining chopped coriander. To freeze this dish, cook the lamb stew up to the end of step 3 and then freeze for up to a month. Defrost thoroughly, reheat in a pan for 10 minutes, or until piping hot, then complete step 4. This recipe was first published in November 2002.